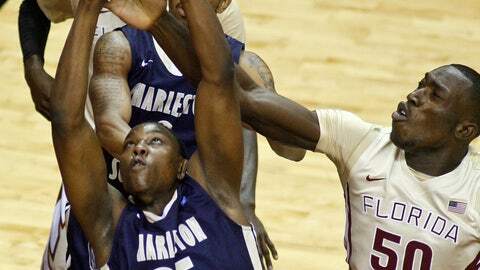 Charleston Southern Buccaneers forward/center Alhaji Fullah (35) fights for a rebound against Florida State Seminoles center Michael Ojo (50) in the first half Monday night. TALLAHASSEE, Fla. (AP) — Florida State coach Leonard Hamilton has an interesting approach on how he uses his personnel and it’s been paying off. Hamilton’s top scorers start the game sitting next to him on the bench, but he insists they’re not being substitutes. "Our starters come in after the game starts," Hamilton said after reserves Aaron Thomas scored 19 points and Ian Miller 15 in Florida State’s 67-59 win Monday over Charleston Southern in its final nonconference game of the season. "We don’t have a traditional starting five." With Thomas and Miller leading the way, the Seminoles’ bench outscored the Charleston Southern bench by a 42-19 margin. Thomas scored 14 of his points in the second half to help the Seminoles (9-3) stay ahead of the pesky visitors, who closed to within 61-56 with 1:20 left before Boris Bojanovsky’s dunk gave Florida State a bit of breathing room at 63-56 with 51 seconds left. "It gives us a better rotation when I can come with my best defender (Thomas) and my best offensive player (Miller) after the first two or three minutes," Hamilton said. Sophomore point guard Devon Bookert aided the Seminoles with a career-high nine assists and a team-best seven rebounds. Paul Gombwer and Arlon Harper each scored 11 points to lead Charleston Southern (5-7), which took 29 of its 50 shots from beyond the 3-point arc. "We obviously weren’t going to go inside," Charleston Southern coach Barclay Radebaugh said in reference to the Seminole front line, which features three seven-footers on their roster. "Their size is astounding. I’ve never seen size like that on a college team. They utilize their size very well." Radebaugh’s team managed just one offensive rebound in the first half. "I thought our team played valiantly," he said. "Our team played with tremendous toughness against a monster of a team." Miller had 11 points off the bench in the first half when the Seminoles reserves outgunned the Charleston backups by a 22-4 margin. Florida State erased an early 6-0 deficit and took the lead for good at 16-14 on Okaro White’s layup with 8:45 left in the half. It was White’s lone basket before he fouled out with 5:20 remaining. The Seminoles held their largest lead at 26-17 in the half. The Seminoles dominated across the board statistically in the opening half with an 18-12 edge in rebounds to go along with seven steals included among Charleston Southern’s 11 turnovers. The visitors had just one offensive rebound against the taller Seminoles in the first half. Hamilton said he admired the Charleston Southern strategy against his lineup. "They want to use as many 3s as they could to neutralize our size," Hamilton said. "I thought we did a very good job of defending. They played the style that gave them the best chance to win the game. Florida State takes a modest four-game winning streak into its ACC opener Saturday versus Virginia.